Asia-Pacific’s Diane Pasco throws a pitch during Game 16 of the Senior League Softball World Series on Thursday, Aug. 2. 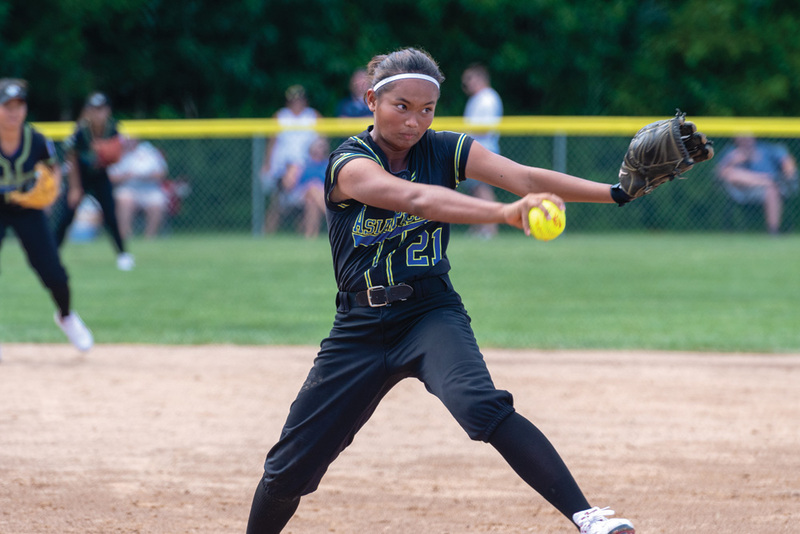 Little League Senior League Softball World Series action continued in Roxana this week, as girls ages 13 to 16 from around the world competed for the title, which crowned the 2018 world champions from Asia-Pacific on Sunday, Aug. 5. Leadup action from Wednesday, Aug. 1, through Saturday, Aug. 4, saw both lopsided victories and tight contests as some of the world’s best young softball players battled it out at the Lower Sussex Little League Complex. • West 12, Europe-Africa 2: The West (Honokaa, Hawaii) continued their unbeaten roll through pool play with a 12-2 shellacking of Europe-Africa in the early game on Wednesday, Aug. 1. Shaylann Marie Grace had the biggest hit in the game for either team, smacking a grand slam over the left-field fence as part of her 2-for-4 plate showing. She finished with five RBIs in the game. Leiloa-Valerie Bustamante and Nanea Kalua’u both collected two hits, with Kalua’u scoring three runs for the winners. Dioni Lincoln and Natasha Molina each scored two runs as well. For Europe-Africa (the Netherlands), Esmee Toet was 3-for-3 with a run and an RBI. Laura Axson, Melissa Hoeverts and Kim Kusters had the other hits for EA. • Central 6, Canada 1: The Central rep from Ft. Wayne, Ind., scored two runs in the top of the first inning, another run in the third and two more in the fourth, which proved to be more than enough in their 6-1 win over Canada (Elnora, Alberta). Four players collected all the hits for Central, with Hayley Urban, Shannon Asiala, Madison Bremer and Kennedy Bond each having two hits in the game. Urban and Asiala both scored a pair of runs, while Bond and Hope Davis scored the others. Kaylee Conn tossed a complete game for Central to pick up the win. She allowed the one run on seven hits and struck out three innings. For Canada, Julie Wagner and Clancy Pennock both had two hits. Darby DeRuyter took the loss in the circle. She allowed six runs — five earned — on eight hits and set down five Central batters on strikes. • Asia-Pacific 0, Southwest 0: Asia-Pacific (Batangas, Philippines) stayed unbeaten in pool play with a 3-1 decision over Southwest (Waco, Texas). With the score tied at 1-1, Asia-Pacific scored two on a double by Princess Pamela Olfato for the go-ahead and winning runs. Winning pitcher Royevel Palma was strong in the circle for Asia-Pacific, striking out 14 in the game while allowing the one run on four hits. Dane Ashley Martinez was the lone A-P player with multiple hits in the game, going 2-for-3. Jeelyn Pajotal, Jamm’n Joyce Rasco, Palma and Olfato had the other hits. Southwest couldn’t take advantage of three Asia-Pacific errors in the contest, as they managed just the four hits off Palma. Kennedy Cox, Erin Young, Veronica DeLosRios and Maci Matthews each had the hits for Southwest. • Southeast 6, West 5: Southeast (Ft. Meyers, Fla.) pick up a dramatic victory with a walk-off over West to pick up a 6-5 decision thanks to a single by Melanie Almanza that scored Madison Isley with the winning run. Dee Bent picked up the win in the circle, going three scoreless innings in relief. She allowed just two hits while striking out two. West had jumped out to a big lead in the first inning, with four runs: Shaylann Marie Grace blasted a three-run home run, and Leiloa-Valerie Bustamante added a solo shot of her own in the very next at-bat. Dioni Lincoln doubled in another West run in the second inning, scoring Kierra-Christina Molina, to push their advantage to 5-0. That would be all the offense for West in the game. Southeast answered and started chipping away at their deficit with three runs of their own in the second inning. Audrey Mills doubled and Jaileene Gonzalez singled to put runners on the corners with no outs. Georgia Waddell hit a grounder to third that Bustamante misplayed, leading to Mills and Gonzalez scoring for Southeast. Waddell wound up on third and then came around to score on another error by the West to make it 5-3. Mills singled in Jamie Jarvis in the third inning to cut the West lead to 5-4. Southeast tied the game up in the bottom of the fifth inning when Gonzalez doubled-in Bent. Grace took the loss for West, tossing 3.2 innings of relief. She allowed two runs on five hits and struck out three. Lincoln and Grace both had two-hit days for West, while Gonzalez and Mills each had multiple-hit efforts for the Southeast. • Southwest 17, East 2: The Southwest used a 12-run fourth inning to break open their game with East (Worcester, Mass.) en route to a 17-2 mercy-rule win. Southwest banged out 19 hits in the game and took advantage of four East errors in the process. Kennedy Cox was a perfect 4-for-4 at the dish for Southwest, with five RBIs, while scoring two runs. Haylie Mitchell and Shelby Lashombe each scored three runs and went 3-for-4 in the game. Lashombe knocked in four, with Mitchell plating three. Erin Young and Veronica DeLosRios added to the hit parade, with each contributing two knocks. Alex Earhart and Emily Rader shared the pitching duties for Southwest, Earhart slinging the pill for three innings, allowing just one hit with two strikeouts. Rader fired two innings, surrendering both East runs on five hits. For East, Amelia Soltys was the lone player to pick up multiple hits, with her 2-for-3 effort. Alexa Diaz knocked in both East runs in the fourth inning. • Central 3, Europe-Africa 2: Central’s Hannah Webb drilled the first pitch she saw in the seventh inning into center, for a game-winning RBI-double that scored Shannon Asiala, for a 3-2 win over Europe-Africa. E-A took a 1-0 lead in the top of the second when Laura Schouten scored on an error. They would add to their advantage with another solo run in the top of the fifth, when Carmen Dijkhuizen singled to center, scoring Kim Kusters. Central recovered to tie the game in the bottom half of the inning when Asiala’s hit was misplayed in the infield, allowing E. Biddle to score. One batter later, Kaylee Conn scored on a sacrifice fly. Conn started the game in the circle for Central, going two innings while allowing an unearned run on one hit. Madison Bremer came on in relief to toss five innings of one-run, two-hit softball with three strikeouts. Esmee Toet was the hard-luck loser for E-A pitching the entire game. She allowed three runs — only one earned — on four hits, with one strikeout. • East 4, Latin America 0: Kayleigh Coffey was practically untouchable during Thursday night’s final pool play game for Group A as East picked up its first win of the week with a 4-0 decision over Latin America (Maunabo, Puerto Rico). Coffey fired a one-hitter with three strikeouts and two walks to lead East, with the lone hit coming off the bat of Latin America’s Omaris Torres. East scored one run in each of the third and fourth innings before adding some insurance with a pair in the fifth. They collected seven hits in the contest, with Natalie Barrera going 2-for-3 with two RBIs. Grace Gigliotti, Emily Gahagan, Molly Lynch and Bridget Murray had the other hits for East. • Europe-Africa 10, Canada 7: Needing a win to advance into the bracket play of the tournament, Europe-Africa did just that with a victory over Canada on Thursday evening. E-A banged out 14 hits in the contest, with Laura Schouten leading the way with a 3-for-4 effort that included two RBIs. Esmee Toet added a pair of hits for the winners, scored three runs and knocked in another three as well. Nazira Charles and Kim Kusters each contributed two-hit performances to the cause. Kaya Knight had the biggest game at the plate for Canada, going 3-for-4 with two RBIs and two runs scored. Clancy Pennock and Julie Wagner each also had two-hit nights, with Pennock scoring two runs as well. • Southwest 9, Central 2: Southwest scored all the runs it would need with a six-run first-inning, en route to the easy quarterfinal win over Central. Jordyne Reese led Southwest’s 14-hit attack with a 3-for-4 effort that included scoring a pair of runs. Haylie Mitchell, Kennedy Cox and Erin Young each picked up two hits, with Young knocking in four runs for the winners. Central received two-hit efforts from Madison Bremer, Hope Davis and Madison Simmons. • Asia-Pacific 3, Southeast 1: With one out in the first inning, Southeast’s Dee Bent smacked a homerun deep into the night to give her team an early 1-0 advantage. It was the lone highlight of the game for Southeast. Asia-Pacific’s Royevel Palma shut down Southeast the rest of the way with her complete-game effort, while striking out 11 with no walks. Jamie Jarvis took the loss for Southeast. Asia-Pacific collected nine hits with Jamm’n Joyce Rasco and Kyla Sophia Aala both going 2-for-3 in the game. Mae Langga knocked in a pair for the winners as well. • East 3, West 1: It was a pitchers’ duel for sure as East’s Kayleigh Coffey and West’s Tehani Epenesa battled pitch-for-pitch in their quarterfinal contest. Coffey went the distance for East, limiting West to just the one run on nine hits. She struck out two to pick up the win and advance East into the semifinals. Epenesa allowed the three runs on just three hits, while striking out three in the loss. Only one of the three runs allowed was earned. East took advantage of five West errors to score their three runs, with Grace Gigliotti knocking in two runs with her single in the second inning. Nanea Kalua’u and Epenesa each had two hits for West. Lisan Mudong plated the lone run for West in the second inning. • Asia-Pacific 8, East 0: Asia-Pacific wasted little time in taking control of Saturday night’s first semifinal on Layton Field, with the only run it would need coming in the first inning. East never had an answer, and A-P just kept piling on for the easy win to advance into the World Series championship. A-P would score two more in the second, three in the fourth and two more in the sixth for the shutout win. Royevel Palma was just dealing from inside the circle. She allowed just two hits over the complete-game performance, with 13 strikeouts. Jeelyn Pajotal did it all from the leadoff spot, going 3-for-3, with three runs scored and two RBIs. Mae Langga also contributed a three-hit night with a pair of RBIs. Jamm’n Joyce Rasco had two hits, two runs scored and an RBI for the winners. Three different players — Amelia Soltys, Grace Gigliotti and Molly Lynch — collected one hit each for East, which faced Southwest in the third-place game on Sunday morning. • Latin America 6, Canada 0: Yessenia Vazquez fired a three-hit, complete-game shutout over Canada on Saturday, Aug. 4, to lead Latin America to a 6-0 win over Canada. Latin America banged out seven hits, led by Joanlly Rodriguez’s 2-for-3 effort. Three different players picked up hits for Canada. Kaley Kowalchuk singled, Erica Knight doubled and Clancy Pennock smacked a triple in the game. Darby DeRuyter took the loss for Canada, allowing three runs on five hits over three innings of work. • Southeast 10, Central 8: Southeast jumped out to a 10-1 lead through five innings over Central, but the team from Ft. Wayne, Ind., was not going to go away quietly. Central would score one in the fifth and six more in the sixth, only to come up short, 10-8. Both teams collected 12 hits in the game, with Southeast’s Melanie Almanza’s 4-for-4 effort tops for the game. She also knocked in three runs and scored another. Southeast’s Dee Bent and Jamie Jarvis also had multiple-hit efforts, with Jaileene Gonzalez plating a pair of runs for the winners. Madison Bremer led Central with her 4-for-5 plate showing that included a run scored and an RBI. Hayley Urban, Hannah Webb and Kennedy Bond each added two hits in the loss. Southeast used three different pitchers, with Jamie Jarvis picking up the win. Central used two different pitchers, as Kaylee Conn took the loss. • West 9, Europe-Africa 1: West pitcher Shaylann Marie Grace hurled a complete-game five-hitter to lead her squad to a 9-1 win over Europe-Africa in this consolation contest. Grace allowed the one run and struck out six for the win. At the plate, Leiloa-Valerie Bustamante was 3-for-3 with three runs scored, while Dioni Lincoln and Tehani Epenesa each chipped in with two hits. Lincoln scored twice and had an RBI. Epenesa added two RBIs to the winning cause. Laura Schouten, Kim Kusters, Willemijn Vissers, Melissa Hoeverts and Noa Fehling all hit safely for Europe-Africa.